Mexican Medical Ministries is an interdenominational non-profit organization, founded in 1963, dedicated to providing low or no-cost health care to the people of Mexico in the name of Jesus Christ. We believe part of the “Great Commission” is bringing healing and hope through medicine and the Good News of salvation through Jesus Christ. We consider it our call to assist others in ministering to the people of Mexico. The mission of Mexican Medical Ministries is to bring healing and hope to the people of Mexico. WE BELIEVE in God the Father, an infinite, personal spirit, perfect in holiness, wisdom, power and love. WE BELIEVE that He concerns Himself in the affairs of men; that He hears and answers prayer, and that He saves from sin and death all who come to know Him through Jesus Christ. WE BELIEVE that the Bible is the Word of God, written under the inspiration of the Holy Spirit, infallible and without error in the original manuscripts and that it is the supreme authority in all matters of faith and conduct. WE BELIEVE Jesus Christ is God’s only begotten Son, conceived by the Holy Spirit. WE BELIEVE in His virgin birth, sinless life, miracles and teachings. WE BELIEVE in His substitutionary atoning death, bodily resurrection, ascension into heaven, perpetual intercession for His people and personal visible return to earth. WE BELIEVE in the Holy Spirit, by whose regenerative work sinful man is born again and by whose indwelling regenerate man is enabled to live a godly life. WE BELIEVE that all have sinned and come short of the glory of God but that the triune God has provided for the forgiveness of our sins. We need only confess our sins, acknowledge Jesus Christ as Lord and Savior, and accept Him into our hearts and lives. Mexican Medical accepts designated gifts, and general donations. Our financial records are audited annually by an independent CPA firm who reports the findings directly to our Board of Directors. Each year we publish the results of our independent audit in an annual report to be accountable to our donors and friends. It all began in the 1960’s. The lower 2/3 of Baja California was isolated from the rest of the Baja because just south of Ensenada the paved roads turned into a pothole dirt road with no bridges over rivers and washes. It was impossible to travel faster than 15 miles per hour on these unpaved roads without tearing up your car or truck. And when the rains came, travel was impossible. Back then there was a young American named Loran Long, who had grown up in Central America, but now lived in a suburb of San Diego. He had accepted the Jesus Christ as his Savior and Lord, and was preparing to be a doctor. He had gone through college and had started pre-med school, when he decided His Lord was calling him to be a missionary. Even though Loran was married and had two children, he transferred to Bob Jones University for the appropriate Biblical training. After completing his training at Bob Jones University he returned to San Diego, and started to travel to San Quintin on weekends to do missionary work. San Quintin is a farming area about 165 miles south of Tijuana. At that time there was only a little settlement consisting of several ranches, a general store and some other small buildings. The several thousand people who labored in the fields back then, lived in adobe houses scattered throughout the area. However, there was no evangelical witness anywhere within many miles. And there was not a doctor within 20 miles; a long way by foot. Loran was so encouraged with the response to the Gospel, that he decided it was necessary to move to San Quintin. So he went to The Baptist General Conference, and they agreed to support him and his family. He then purchased a 50 foot mobile home, obtained permission to place it on the Hussong Ranch, about one mile inland from San Quintin, and moved there in 1962. After moving, he obtained a redwood water tank, and built a 8′ x 8′ plywood storage shed, from which his wife was planning to teach second and third grade to their two girls. However, the people in the area soon found out that Loran had gone to pre-med school, and they would walk to his mobile home every day of the week to ask him to help them with their sickness and injuries. So Loran started to obtain all of the medical samples he could from doctors in San Diego, and using a Physician Reference Book, he started treating the people out of what was suppose to be the storage shed/school house. That shed became the first medical office in San Quintin. In 1965 Loran was in a Baptist church in California, talking about the work, needs, and ministry opportunities the in San Quintin area. After that meeting, 39-year-old Frank Kuster asked Loran if he could fly down with some of the specific items needed. Now Frank and his wife had moved in 1961 to southern California from the central part of the USA where he was raised, educated as a Mechanical Engineer, and where they were married and had their children. Shortly after arriving in California they attended this Baptist church, accepted Jesus Christ as their Savior, and were baptized. Also since moving to California, Frank learned to fly, purchased a plane, and was looking for ways to serve the Lord. Within two weeks of that meeting in the summer of 1965, Frank and another person flew into San Quintin with the supplies the church people had gathered, However it was very apparent to Frank that what Loren really needed was help, So when he returned home, Frank told his wife and their church what he had seen, and shared the idea of taking a year off from his work to go and help. They all prayed about it, discussed it all with The Baptist General Conference and in September, 1965, Mr. and Mrs. Kuster leased out their house, purchased a 60 ft. mobile home, hauled it to San Quintin, and began their work. Much was accomplished that year. In the fall, Mexican Medical was formally incorporated, and a large plot of land next to the Hussong Ranch was purchased. A surplus military Quonset hut building was also purchased from a private airfield, dismantled, trucked to San Quintin, and reassembled into two buildings – a machine shop and a medical building. 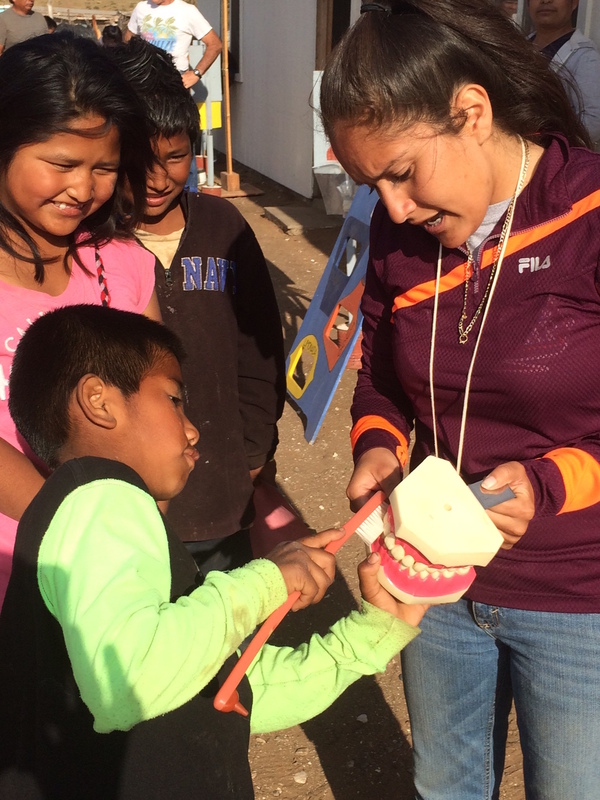 It was the first clinic in San Quintin, consisting of four rooms: an office/examination room; a one-bed ward, a dental room, and a medical supply room. That year they also borrowed a road grader, and created an airstrip – which would also be the beginning of Mexican Medical’s fly-in ministry. Today, Mexican Medical is active throughout Baja California, and other parts of Mexico, partnering with churches, clinics and hospitals. Mexican Medical is active in the USA and in Canada sending part and full-time missionaries, individuals, and teams of people to Mexico to assist in the construction, development and expansion of these clinics and hospitals, to assist the doctors and medical staff with surgeries, etc., and to work with local churches in their evangelistic outreach programs.